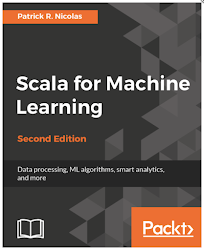 Although most of Scala developers have some level of knowledge of curried and partial functions, they struggle to grasp the different use case either of those functional programming techniques are applied and their relative benefits. For those interested in more detailed explanation of currying existing functions, I would recommend the excellent post of Daniel Westheide. Partially defined functions are commonly used to restrict the domain of applicability of function arguments. The restriction can apply to either the type of the argument or its values. Let's consider the computation of square root of a floating point value dsqrt. The value of the argument has to be positive. A simple implementation relies on the Option monad. The same method can be implemented using a partial function by applying the matching pattern to the argument as follows. The method dsqrt return an object of type PartialFunction with an input argument of type Double and an output of type Double. The method can handle only input value x >= 0.0. Any other input value generates a MatchErr exception. // "throws scala.MatchError: -3.6 (of class java.lang.Double)"
A similar restriction can be applied to the type of argument. Let's consider the incremental methods add1 (line 3) and add2 (line 15) of class Value. These two methods process values of type AnyValue. It requires that the type of argument to be checked. add and add2 described two alternative and crude type safe checking approaches. The two implementation add1 and add2 are cumbersome to say the least. An alternative implementation using a pattern matching on the type an returning a partial function is far more elegant. In the example above, we do not have to handle the case for each the argument has an improper type. The partial function will simply discards it. Note: The method Actor.receive that define a message loop in an actor, consuming messages from the mail box are indeed partial functions. Most of high order methods on collections are curried. The following example illustrate the commonly used foldLeft.